Here is another image from last weekend. This was shot at the John Deere Marsh, right beside the road, and about a kilometer away from the main channel of the Mississippi River. This young muskrat had absolutely no fear and kept chewing on fresh grass tips even after I just parked my car right beside it. 200 mm focal length was enough to make this picture and I employed the Nikon Nikkor 200 f/4 on the D750. I made a slight crop in post for esthetic reasons. Too many bleak sticks after the winter distracted from the subject, this beautiful little muskrat. Their fur looks great when it is dry. I saw and heard an adult calling from down below the river bank but this little bugger gave a dam and kept chewing on the first fresh grass. Some people are put off by anything that is called a “rat”, although this rodent is not a member of the genus rattus. 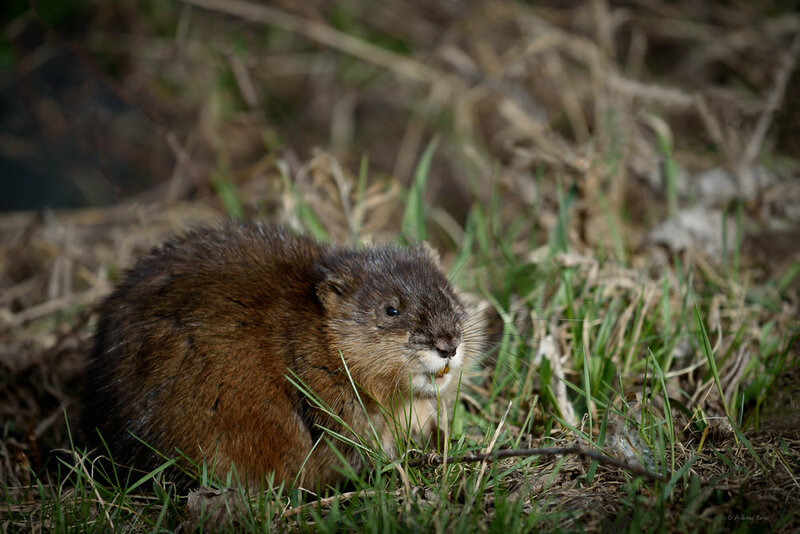 Muskrats are smaller than beavers and they share quite often the same habitat. Their diet is 95% plant materials.